Gothic style of architecture came about during the 12th century in France, and was prevalent till the 16th century. It spread across Europe and was mainly used in building churches and cathedrals. Classic characteristics of Gothic architecture includes ribbed vaults, stone structures and pointed arches. Palaces, town halls, castles and other such magnificent structures were also sometimes built in this architectural style. This form of architecture that was unique to Europe, reached India during the rule of British. When Christianity was introduced to India around 52 AD, architects started building churches and cathedrals of India in the same form. Luckily, most of these structures stand tall and strong till date. Revel in the beauty of Gothic architecture by visiting these churches in India during this Christmas. Built in 1936 using a Neo Gothic style of architecture, the St. Philomena's Cathedral is one of the tallest and most spectacular churches of Asia. The church has twin spires that are of 175 ft in height, resembling the spires of Cologne Cathedral, which is a famous church in Germany. This church was built to honour St. Philomena, who was a Catholic Saint and martyr of the Roman Catholic Church. It is now one of the most prominent landmarks of Mysore. Also known as San Thome Basilica, it was built in the 16th century by the Portuguese. It is one of the three churches in the world that was built over the tomb of one of the twelves apostles of Jesus, Saint Thomas. The other two churches are built in Vatican City and Spain. The church was rebuilt by the British in 1893 and that is the version we see today. This church is a Roman Catholic minor basilica that has high spires, tinted glasses and a museum that consists of artefacts related to Saint Thomas. 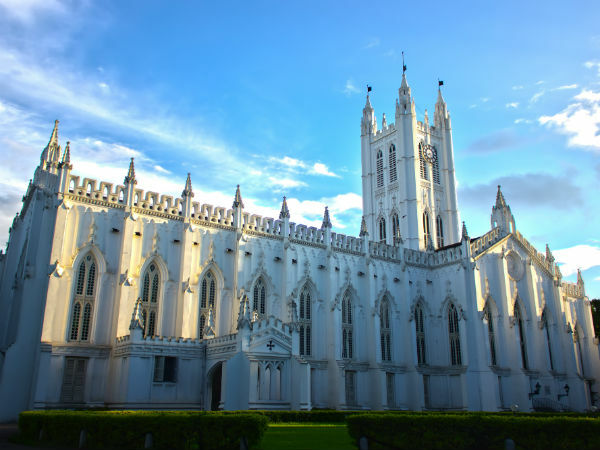 One of the finest examples of a church built in Gothic architecture is the St. Paul's Cathedral in Kolkata. While it was laid out in 1839, the construction was completed by 1847. It is located close to the Victoria Memorial on Chowringhee Road. It was redesigned in an Indo-Gothic style of architecture after it was affected during the earthquake of 1934. The church has a 201 ft central spire, 5 clocks that weigh 3 tonnes each, and has intricate detailing that is done with tinted glasses and plastic art forms in the interior. Officially known as the Basilica of Our Lady of the Mount, the Mount Mary Church is situated in Bandra, Mumbai. One of the most popular attractions of the church is the Bandra Fair, which is a celebration that goes on for a week and also is the time when thousands of people visit the church. Bandra Fair follows the feast of Blessed Vrigin Mary, which falls on the first Sunday after September 8 every year. This Roman Catholic Basilica is perched at a height of 262 ft above sea level, which is decorated beautifully during the fair. Locally famous as Patthar Girja which means "Church of Stones", the All Saints' Cathedral is a fantastic structure located in Allahabad. The architecture of this glorious church is Sir William Emerson, the man who also designed the famous Victoria Memorial of Kolkata. All Saints' Day celebrated on November 1 annually marks the anniversary of the church. It gleams with the beautiful architecture of a colonial India. The church is big enough to accommodate 300-400 people at once, and is situated amidst lush greenery.